How can you ensure that your campus is here to stay? Major changes in academic demands, employment needs, and student demographics have created enormous challenges for colleges and universities. Now more than ever, institutions need a strategic, data-driven plan that will meet their enrollment goals and fiscal needs to achieve long-term institutional sustainability. Join us in Chicago for a hands-on forum for campus leaders. You’ll learn directly from experienced strategic planning experts and collaborate with campus colleagues as you analyze fiscal, academic, and resource challenges in order to create a plan that will help your institution thrive. This year’s forum has expanded to include both strategic enrollment planning and institutional strategic planning, so that campus leaders can engage in a full exploration of topics that impact institutional sustainability. Sessions include hands-on planning time for teams. By the time you leave, you will have already completed a substantial amount of the preparatory work required for an effective plan (identification of scope, topics, tasks, etc.). See the full agenda. For maximum benefit, bring your entire cabinet or executive leadership team to evaluate high-impact strategies that cross divisional lines. The Executive Forum will take place at The Blackstone Hotel in Chicago. See more information about accommodations. The following consultants from Ruffalo Noel Levitz will lead discussions on emerging trends, recent research findings, and effective planning processes. See the hour-by-hour agenda to learn about the specific topics to be discussed. Sarah Coen is our leader for enrollment consulting. She offers nearly two decades of experience in higher education enrollment management and has consulted with a wide range of institutions. Dr. Lewis Sanborne is the Ruffalo Noel Levitz leader in strategic enrollment planning. He has more than 20 years of experience in higher education enrollment management and has worked with colleges and universities of every size, type, and mission. Gary Fretwell has been a catalyst for enrollment success on hundreds of campuses. His guidance has helped institutions establish strategic and tactical enrollment plans, data-driven retention programs, and more coordinated internal operations. Dawn Hiles is a higher education veteran with experience in enrollment and fundraising. Before coming to RNL, she served at Drury University as vice president of enrollment management and as vice president of alumni and development. Wes Butterfield oversees financial aid services at RNL. He has consulted with dozens of campuses on achieving enrollment and net revenue goals, increasing the effectiveness of student recruitment, and optimizing their enrollment management efforts. Stephanie Franks-Helwich is an expert in adult, online, and graduate (AOG) enrollment, helping institutions develop solutions to improve financial sustainability, achieve successful outcomes, and sustain AOG programs. Dr. Michael Williams has assisted more than 160 colleges and universities with academic program cost and demand analysis, predictive modeling for admissions and advancement, financial aid analysis, and retention analysis. With more than 35 years of experience in higher education, Dr. Brenda Williams offers a wealth of insights on effective retention strategy. She also served as vice president of academic affairs and dean of Mitchell College. 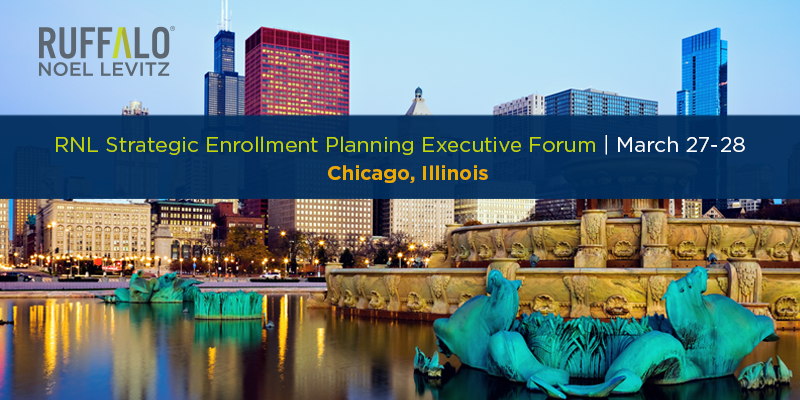 The Strategic Enrollment Planning Executive Forum will assist you and your colleagues with creating or fine-tuning a data-driven strategic enrollment plan. It will be led by Ruffalo Noel Levitz facilitators with decades of enrollment management experience. Free additional session on Institutional Strategic Planning: Our second day will include an optional session on institutional strategic planning (ISP) to dive deeper into issues related to mission, vision, finance, infrastructure, and other key topics. SEP Q&A and wrap up, adjournment for those not staying for the last session. Boxed lunches will be available for all attendees. This is a preliminary agenda and is subject to change. Many sessions include hands-on planning time so by the time you leave you will have already completed a substantial amount of the preparatory work required for an effective plan (identification of scope, topics, tasks, etc.). To receive the special rate, attendees must book their rooms by March 11, 2019. However, the special Forum rate may sell out before the deadline, at which time rooms will be provided on a space- and rate-available basis and may become completely unavailable. Click here to make a reservation. Note: a portion of the guestroom charges will be credited to Ruffalo Noel Levitz to offset The Blackstone Hotel food and beverage and other onsite forum expenses, and to minimize registration fee increases. Each forum attendee will receive a free copy of Strategic Enrollment Planning: A Dynamic Collaboration. The most comprehensive book on the subject, it dives into detail on the topics covered during the forum and features chapters from the forum presenters among other experts. Want us to Speak or Exhibit at Your Conference?